SETTING UP YOUR TEMPORARY KITCHEN OR HOW THE HELL DO I SURVIVE THE TURMOIL - Kitchens By Design, Inc. The demo guys are coming! Which means you won't have a full functioning kitchen for the next couple of months. Now a new set of questions pepper your thoughts. How is my family going to get by without a kitchen? No sink, no cooktop, no oven...where do I put all my dishes? How will my kids eat? Where will they eat? Your task is to set up a temporary kitchen somewhere else in your home. Meet with your design/build team in advance about options of setting up a temporary kitchen. At that meeting, discussions need to take place that take into account all the logistics of carrying out a renovation of your kitchen. Here are some things you should consider before you get down to the business of setting up a temporary kitchen. Talk about safety first. Who will secure the home during the job? How will people come and go especially if work is carried out during the day and not necessarily first thing in the morning? List emergency numbers for all men working in the home in case (God forbid) there is an emergency that calls for your immediate attention. Discuss any specific family needs that can not be interrupted during the time of renovation. Are there children in the home and/or pets? The job site (the kitchen or other rooms being worked on) should be off-limits for all family members and pets during work hours. Go over items that you want saved so that no one throws out a personal item important to you and your family. Appliances are usually given away or sent back with your appliance dealer (you must request this from the appliance dealer) once they bring the new appliances into the home. However, before that happens you need a few of these appliances to help you survive. The most common room used for a temporary kitchen is the dining room, with the family room coming in a close second. You may also consider using part of your basement as a temp kitchen. This is an especially good option if you have water hook-ups for a sink. Whichever room you choose, you'll need to move your refrigerator. Place your refrigerator on some protective materials so that your floor doesn't get damaged. Bring your portable microwave oven, toaster oven and slow cooker. If you don't already have one, invest in an electric skillet. It's a most valuable tool for making quick and healthy meals for you and your family. 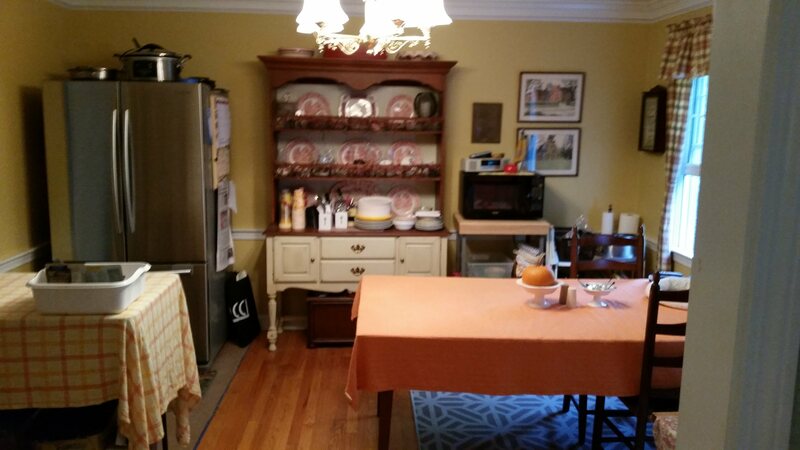 Attached is a picture of a great "temp" kitchen that one of my clients set-up. It worked for 10 weeks. Now you are on your way and at least you have a small space to go to for some solace, especially when the window gets installed in the wrong place or your plasterer buries two recessed lights in the ceiling. With your temporary kitchen in place, it's time to test your electric skillet skills! Here's a quick recipe to help you survive the renovation. 1. In a plastic bag, mix flour, salt, pepper and paprika. Place chicken in bag and shake. 2. Take chicken out of bag and brown the chicken on both sides in skillet with olive oil and butter. 3. Add mini potatoes and diced onions to skillet. Add the chicken broth. 4. Cover and cook until potatoes are done. Take chicken and potatoes out of mixture. 5. Add the sour cream to the mixture. Heat and then pour over chicken and potatoes. I'll talk to you next about the execution of your job and how you are the best project manager on the job.